CAMBRIDGE - People whose homes were lost or damaged in Saturday’s 10-alarm fire in Cambridge received mental health and medical care at a Red Cross shelter inside the city’s War Memorial Recreation Center. They were offered food, a bed, and spiritual counseling, said State Representative Marjorie Decker, one of several public officials who turned out to assist residents. 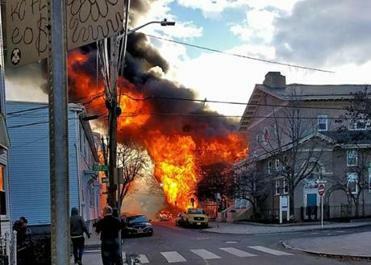 At least 60 people were displaced in the blaze that broke out just before 3 p.m. on Cambridge Street in East Cambridge, summoning firefighters from at least 20 area communities. Decker was at the shelter Saturday night with State Representative-Elect Mike Connolly and Cambridge City Councillor Nadeem Mazen. Media was not allowed into the shelter, to allow residents privacy to come to grips with their devastating losses. Many of them are in shock, Decker said, and do not know if they will ever be able to return home. Well-wishers brought donations to the shelter on Saturday, but Decker said the best way people can help is to donate online to the Cambridge Mayor’s Fire Relief Fund. Donations can also be sent to Cambridge City Hall, 795 Massachusetts Ave., 02139. As of 10:30 p.m. on Saturday, more than $34,000 had been pledged by more than 500 people online. Decker said she’d heard reports that Cambridge residents have offered to let their displaced neighbors stay at their homes, a demonstration of Cambridge’s compassionate character. “This is Cambridge, we come together. We take care of one another,” Decker said.